Se organizeaza o selectie ! Vezi mai jos pentru ce ! APMAM is a NGO based in Iasi, Romania who aims to promote civil rights and personal development through legal mediation. We offer help both to professional (mediators, lawyers, teachers etc.) and citizens who look up mediation as a possible tool for solving conflicts. 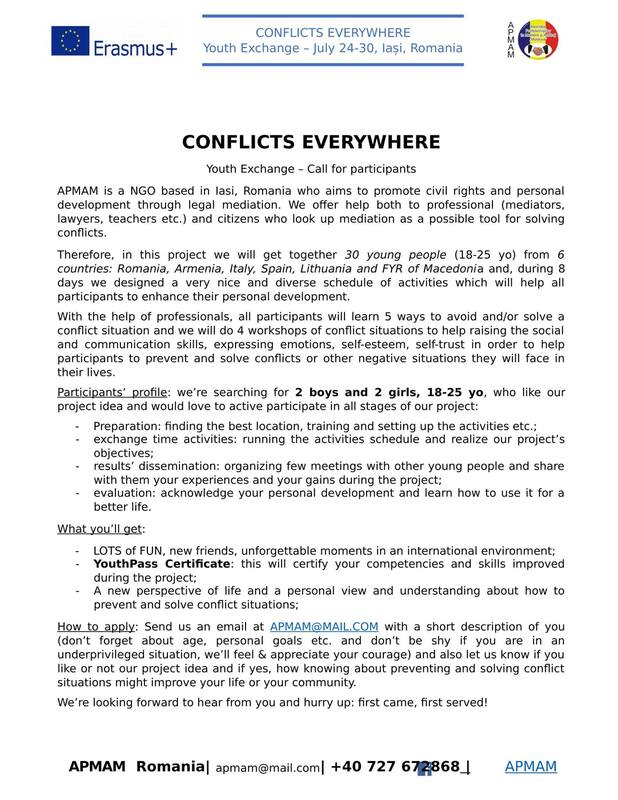 Therefore, in this project we will get together 30 young people (18-25 yo) from 6 countries: Romania, Armenia, Italy, Spain, Lithuania and FYR of Macedonia and, during 8 days we designed a very nice and diverse schedule of activities which will help all participants to enhance their personal development. With the help of professionals, all participants will learn 5 ways to avoid and/or solve a conflict situation and we will do 4 workshops of conflict situations to help raising the social and communication skills, expressing emotions, self-esteem, self-trust in order to help participants to prevent and solve conflicts or other negative situations they will face in their lives. –	evaluation: acknowledge your personal development and learn how to use it for a better life. How to apply: Send us an email at APMAM@MAIL.COM with a short description of you (don’t forget about age, personal goals etc. and don’t be shy if you are in an underprivileged situation, we’ll feel & appreciate your courage) and also let us know if you like or not our project idea and if yes, how knowing about preventing and solving conflict situations might improve your life or your community. We’re looking forward to hear from you and hurry up: first came, first served!